I’m not going to lie my hop plants look terrible. 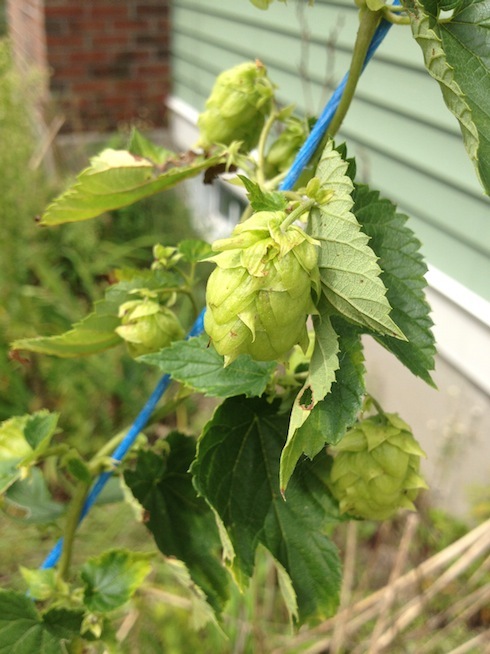 While this has been a really good year for growing hops, I’ve only had so so success. This is my first year growing hops, so I didn’t expect much as the plants establish their roots. I also didn’t get them into the ground until late in the season, despite our warm spring. The old rhizomes I purchased last year didn’t sprout, so I purchased a new set of plants rather than rhizomes, Perle, Centennial, and Galena. Of the three purchased plants, the Perle completely died. The galena planting has done better, but the centennial is just now showing real signs of growth. I’m still hoping they will have enough growth established to withstand a New England winter. In addition to the 3 plants I purchased, I was given 2 other plants, Hallertau and Cascade. They have done the best out of all of my plants, but have been have been hampered by pests, and the leaves are rusty on the edges. From what I understand it seems like they just aren’t getting enough water. I take full responsibility for not keeping them watered, as for the pests, I’m not quire sure what to do. I should have been much more attentive in watering and weeding. We’ve had a really dry season here, and I don’t have a soaker hose setup. With that said, it doesn’t look like I’ll be harvesting much if any usable hops this fall, unless there is a late surge in growth. I wasn’t’ expecting much from first years growth, but was hoping to have enough for at least one brew, but that’s not going to be the case. There is always next year. The plans for next year. Next years plan is to get a 5th plant going. 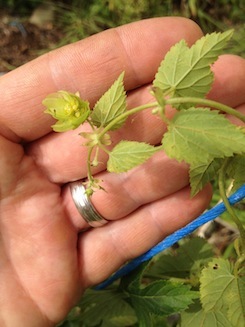 I have an order for wet hops due any time now, and I’m hoping to be able to grow a cutting from the amarillo I’m getting. I’ll also be trying some alternate twine (thanks Lyn for the recommendation), and get a soaker hose setup. A more vertical trellis setup will have to wait until 2014.